The beauty of preparing Black Cod for family and friends is it is intensely flavorful and high in omega 3 so you know it is also healthy as well as delicious. So whether you call it Black Cod or Sablefish it makes the dish to be shared with family and friends. Black Cod also known as Sablefish prepared with miso gives you and your guest a traditional Japanese meal that will definitely have them begging you for your recipe. The beauty of preparing Black Cod for family and friends is it is intensely flavorful and high in omega 3 so you know it is also healthy as well as delicious. Black Cod has a delicate buttery texture which makes it perfect to place over a bed of mouthwatering sweet roasted potatoes for a perfect meal that will please all. Black Cod can be prepared in a variety of styles such as grilled, smoked, poached or even roasted to satisfy your taste. Our Black Cod fillets come directly to your kitchen packaged in one-pound gold foil vacuum sealed packs for your convenience of using multiple packs to feed a group of people or for a more intimate affair use only one pack knowing that you still have plenty on hand that will remain fresh. So whether you call it Black Cod or Sablefish it makes the dish to be shared with family and friends. As a fresh black cod supplier we ship fresh and frozen black cod worldwide. 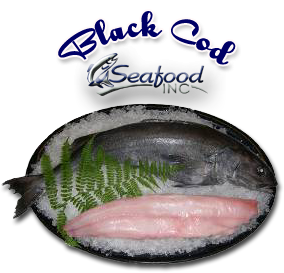 Seafood Inc is dedicated to superior quality of its frozen and fresh black cod.